Boardman native Michael Mannozzi won the USA Track and Field National Championship 40 k (24.8 miles) Race walk on October 13 in Asbury Park, New Jersey. This is his second national title this fall, and third in his career, having already won the 30k championship on September 15 in Valley Cottage, New York and the one-mile event at New York’s Armory in 2012. Mannozzi won the event with a time of 3 hours, 28 minutes, 49 seconds, the fastest winning time in the past six years. As a result of his win, USA Track and Field has named Mannozzi Athlete of the Week. “I attribute a lot of my success to the help I get from Dr. Michael Lyons at Advanced Chiropractic and Rehab in Boardman. Dr. Lyons has been a great asset to my training. With his help, I am able to compete at a high level while remaining pain free.” Stated Mr. Mannozzi. 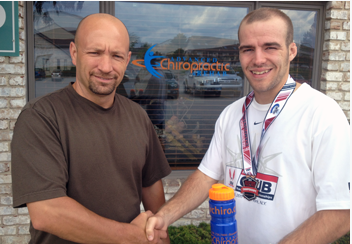 Advanced Chiropractic sponsors Mannozzi and helps him toward achieving his goals with regular chiropractic treatment. Racewalking is very stressful on the body and Mannozzi feels that the chiropractic treatment he recieves in his office helps him to recover faster, reduce injuries, and increase flexibility. Mannozzi also plans to compete in the 50k National Championship on November 24 in Coconut Creek, Florida. Mannozzi competes as part of the Shore Athletic Club of New Jersey, a multiple time USA Track and Field National Club Team Champion, which has fielded many Olympians over the years, including three in 2012 alone. Race walking combines the endurance of the long distance runner with the attention to technique of a hurdler or shot putter. It is a sport in which the competitor is required to keep one foot on the ground at all times. Additionally, the leg supporting the body weight must be kept straight. This combination results in a shorter stride length, which means the racers’ pace must be quickened, reaching a step cadence comparable to an Olympic 800 meter (half mile) runner, but for hours at a time, due to the length of the race. Race walking became an Olympic sport in 1904. Mannozzi competed in the 2012 Olympic trials in both the 50k (31 miles) and 20k (12.4 miles) events, placing ninth and fifth overall, respectively. Mannozzi is currently eyeing the 2016 Summer Olympics in Rio de Janeiro as well as the 2020 summer games in Tokyo. A 2005 graduate of Boardman High School, Michael was a standout athlete in wrestling before attending and wrestling at Youngstown State University and at Notre Dame College in Cleveland. He currently works as a day camp counselor, while also filling in at the D.D. and Velma Davis YMCA in Boardman.